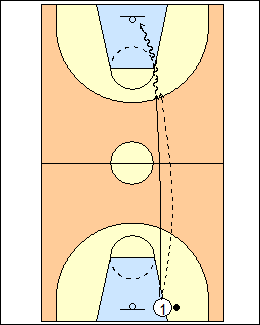 Toss the ball to about halfcourt, sprint to catch before the ball bounces twice, take a layup with two dribbles, continue. 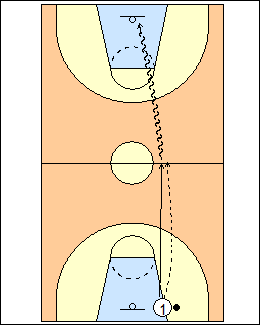 Toss the ball upcourt, don't let it bounce twice, score with one dribble. Alex Daniltchev - players lob the ball from the foul line, run to catch their own pass and make a two-step, no-dribble layup at the far basket. See Dribbling - 5star point-guard push.